THIS RESTAURANT IS CLOSED DUE TO BRISKET BANDITRY. La Morenita is the kind of little corner taqueria that dots the landscape of Texas by the 1000’s. A small, tidy, family run cafe ready to serve up three squares a day for hungry eaters. It’s bright and early and the little dining room is filling up. Black folks, brown folks, white folks…all kinds of folks from the neighborhood are streaming in for a Mexican breakfast before they get along with their day. I join the queue and look about the small dining room as I wait my turn. Some very nice religious iconography is on display as well as the typical dollar store Mexican art that abounds in almost all Austin taquerias. Inquiring after which tortilla is homemade, I’m met with the standard response in Austin “neither”, my hopes for a top notch breakfast evaporate. I pay my $1.65 and take the walk that condemned men [commercial tortilla eaters] all take during their life. 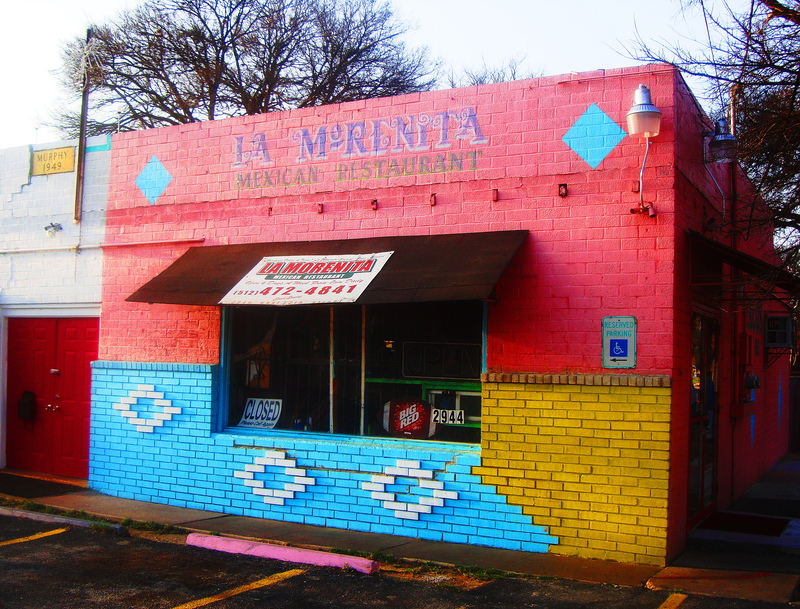 La Morenita’s bacon egg and cheese breakfast taco is standard fare. If they were aiming for the middle of the road then they certainly succeeded. While this taco would perhaps be greeted with shouts of triumph in Dubuque, in Austin, it’s just a regular C grade version of a food that can be transcendent in the skilled hands of a dedicated taquera. In this one egg taco, the cook has been stingy with neither cheese nor bacon. A green salsa advertised as “hot” is not, but it’s no matter. While this taco will provide needed sustenance for a couple hours it’s not going to send one to the water cooler with tales of the wondrous breakfast you happened upon. This entry was posted in The State of Bacon Egg and Cheese Breakfast Tacos in Austin Texas and tagged Austin, bacon, bacon egg cheese, breakfast tacos, cheese, corn tortilla, east austin, egg, Mexican, salsa, tacos, taquera, taqueria. Bookmark the permalink.